Welcome to Lowered Expectations, the week ten edition! Each week, we go about posting chalkboards and GIFs of the weekend’s best open-play shot attempts that did not quite live up to expectations (and rarely do we update this paragraph). We look at each one and not only evaluate the results, but also the process that led to them. The buzz through most of the first third of the season for MLS SuperDraft picks has pretty much belonged to Chris Mueller, while Chris Baird has mostly flown quietly under the radar as a useful sub and second string fill in. 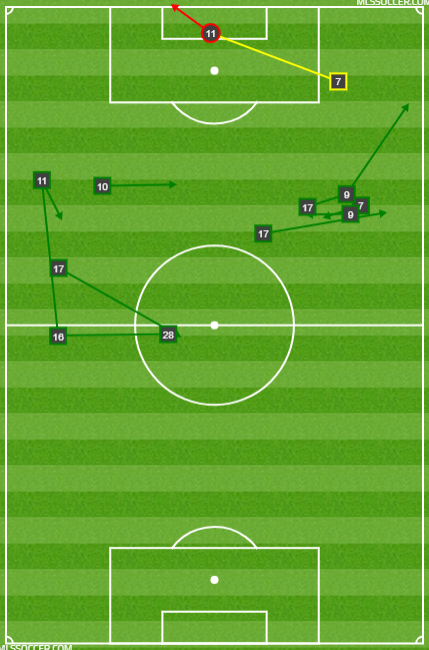 But Baird so far has been effective stepping in for RSL, despite starting the season third on the depth chart. Looking back to the development of this counter attack; the pass by Joao Plata is marvelous, and overall it’s a bit of a letdown that no goal is scored because it’s such a aesthetically pleasing progression. Let’s rewind this and start from the beginning. Albert Rusnak wins the ball off a poor pass and immediately turns it to Jefferson Savarino who provides the one touch needed to set Savarino free to go forward. Sometimes hold up play isn’t bludgeoning center backs while waiting for guys to move forward, but a simple return pass back to set-up the counter attack while spreading running lanes. Will Bruin has moments of doing this with Seattle creating combinations for Clint Dempsey and Nicolas Lodeiro, as does Fanendo Adi with Diego Valeri, and of course there's the Jozy Altidore and Seba Giovinco connection. There is also, to a lesser extent, Maxi Urruti, Chris Wondolowski and Patrick Mullins all having shown a propensity for doing these quality one touch passes in combination on the counter. Here, Baird does it with Savarino cutting inside which drags the full back and allows Baird to peel off and soak up rays in free space. While Baird runs unchecked down the right flank, Lamine Sane checks him, but tries to stick in the middle and not roam wide, which could stretch the defense vertically and create larger running lanes. It is smart, but with Orlando having an extra player back, it's probably the wrong play. Once Savarino receives the pass and crosses the middle of the park, he rotates the ball wide to Plata. Plata is extremely dangerous in these situations and it’s not uncommon for him to bust down the sideline here and beat a full back by cutting inside and either directly creating a high leverage shot or finding someone else in the middle of the box. Will Johnson tries to funnel Plata back into the middle of the park which is probably an ideal location from his perspective, but unforeseen to him is that Plata now has space to pick out Baird. Baird comes barreling in from wide with no marker. Only Sane is there to try and repel the cross, and his poor positioning prevents him from safely clearing the ball away (which is what should have happened here). Instead, the ball drops right in Baird's lap with a brilliant trap and quick shot. The save by Joe Bendik is kind of a weird one. He’s coming down on the ground but he keeps his body upright just long enough to make the save. My podcast co-host Ian Lamberson on just about weekly sends me messages on “how good” Bendik is and here is an ideal highlight for him as I really feel this is great technical save. I’m could hijack this whole thing just to spend words upon words to talk about the difference maker that Alberth Elis has become for Houston this season. I won’t but know that I could. For now let me focus on Mauro Manotas and this running header inside the box. Spoiler Alert: it’s not great. Most weeks this would be a bit higher than fourth on the list, considering the positioning of the shot. It’s made all the worse by the fact that David Bingham allows the ball to get over his head. Let me take a moment to really highlight Bingham in this replay. I seriously have no earthly clue what the hell he’s is doing. It kind of looks like he wants to give Michael Ciani a hug after not seeing him for in the last 30 seconds but... well, yeah that’s pretty much all I have. I don’t often feel like someone has to finish a shot. But this feels like a huge miss. Manotas is wide open, wins the attempt easily but can’t direct even in the general direction of the goal. It’s kind of mind numbing. The problem is that there really are so many things that can and do go wrong with headers that when situations like this occur it’s worth a heavy sigh, a sip of whiskey and a shrug of the shoulders. I’m not positive as to what Oscar Boniek Garcia was attempting here. It seems mostly obvious that he was taking a shot, but it seems so unfathomably silly from his positioning. It’s almost like a clumsy version of Jimmy Medranda’s goal, only worse. This also comically sums up the LA defense as Rodriguez is unmarked in the middle of the box, and puts home the rebound in the left corner like a boss. Everyone seems to converge there on the far corner, as Romell Quioto gets to the deflected header from Jørgen Skjelvik. I honestly can’t fathom how he gets the ball to be redirected first off the ground and then the upright but it all seems pretty unlikely series of events and it sets up Rodriguez perfectly for the game winner. Quioto himself has been finding that form that he sported at times last year, which is a true difference maker out on the wings. With Elis absolutely tearing things up from the right side this season Quioto is going to get less attention. When that’s happened he’s absolutely made the most of it. The real questions that revolve around Quioto are: a) is he going to start being a consistent threat at goal (which being a winger, probably not)? and b) is Houston coach Wilmer Cabrera going to be patient when he starts to drop off? Quioto has only started four of eight dynamo games this season and Cabrera has seemed perfectly content at times to go with Andrew Wenger over the Honduran. Which probably seems crazy, but Wenger has shown good with that faith extended him. It should be an interesting storyline to see develop over the next few weeks. I’m hoping Eric covers this one on his “Setting the Table” piece later today because Daniel Lovitz deserves some love for what he’s done and continues to do this season with Montreal through his passing. Presently, among fullbacks he’s second in expected assists, trailing only Graham Zusi, with 1.8 xA. This attempt by Raheem Edwards is another result of movement and team combination. Edwards does a good job of staying onside after the initial pass from Lovitz to Anthony Jackson-Hamel gets sent right back to sender after an outstanding tackle by Luis Caicedo. The loose ball forces Edwards to hold his near post run, but Lovitz quickly picks him out and sends in a perfect cross to create a shot. Gabriel Somi gets beat to the ball despite having the position. He somehow loses track of Edwards as it looks like he only checks over his shoulder once to check in on Alejandro Silva, who you can signal for a far post run. It’s almost like Somi assumes no one else is in the box. Lovitz sends the ball into Edwards tries to knock this shot in a one time fashion, Alexander Ovechkin style, scooping it up and trying to put it on frame. Instead he barely gets a piece of it and is unable to redirect anything with his left foot swing. I’m a bit surprised that I haven’t seen it mentioned much, but with Edwards moving from wing back to full attacking winger this past year I feel like this is one of those moments where people point to his “lack of a finishing skill”. The thing is that I just can’t buy that narrative as to why he missed the shot. He showed a propensity and talent to be able to do similar things in Toronto last year. Aside from it being a “mental” thing, as coach Rémi Garde kind of implied last week, there isn't much of a reason why Edwards would have missed the attempt. Besides that, an event that didn’t lead to a goal was the most probably thing to happen or maybe it was just a bit of a bad luck. Number of passes in sequence: Eleven! This is textbook, classic Ola Kamara. The movement is absolutely perfect and the timing of the pass from Romain Alessandrini, who he’s obviously already built a strong relationship with, is perfect. It’s just a bit of an unlucky finish that he doesn’t get more of the ball. LA Galaxy has had plenty of woes this year, and I’m trending more and more towards the belief that Sigi Schmid won’t last the season. But despite everything; the build-ups, the lack of support, the addition of a global super star, and now a change of position, Kamara's still been his same effective self. Kamara has seen a reduction in total shots each of the last two seasons, and despite not being in the elite expected goals tier he'd been in, he’s still very good and undoubtedly better than many had thought. That said, an interesting thing has been added to his game this season that has him back in “elite stat status”; key passes. He’s had a bit more of his team's touches over the season but is still roughly distributing the same amount of passes in the final third, however they’re being turned directly into shots more frequently. It’s still really early with Kamara only checking in at 740 minutes this season (about a third of the way through) so this is something to wait and see if it continues or if it’s just one big game that inflates the numbers as a whole being early. If he hadn’t built the obvious relationship with Alessandrini I’d be more skeptical but right now count me intrigued. One of my first fears about pairing Walker Zimmerman with Laurent Ciman was that both are very aggressive event piling center backs. Ciman steps to Urruti which in and of itself isn’t bad but it’s a bit slow and Maxi Urruti, someone not especially swift of foot, turns and has a 25 yard free look at goal. This really honestly isn’t a great shot, and I’m surprised that Tyler Miller doesn’t get a hand on it. Maybe the shot has just enough velocity to skip by Miller. Maybe Miller was overconfident. Maybe there is just enough luck on Urruti’s side. Maybe it’s a bunch of those compounding factors. If I was someone on LAFC’s coaching staff, Ciman is the person I’d be having a discussion with. I’d be looking at a compilation of shots near and around the top of the box specifically, searching to see how Ciman has performed. It’s not that Ciman has looked bad this year, he’s actually been really good. But he’s 32 and I think LAFC should be having the talk with him in regards to his first step. I’m not sure anyone gave it much notice or if most of you have already figured it out, but there is some discrepancy between Opta's expected goals model and our multiple models. First and foremost, there isn’t one right way to do this. Much of this is about preference and the intention of the model. Ours is mostly intended to predict future outcomes rather than be descriptive. Mark Taylor wrote a rather brilliant piece last year on the differences in trying to incorporate such subjective events such as big chances. According to Opta “big chances” are defined as "a situation where a player should reasonably be expected to score usually in a one-on-one scenario or from very close range." While they are specifically valued more highly (a type of multiplier) in Opta’s model, they are not used in either of ours. As referenced in Ben's tweet above, Opta showed Seattle with 0.84 xG on their 17 shots, and Columbus with 1.05 xG on their five shots. Conversely, both our models scored them as 1.23 and 0.76 xG respectively. That's a difference of +0.39 xG for Seattle and -0.29 xG for Columbus between Opta's model and ours. But why? 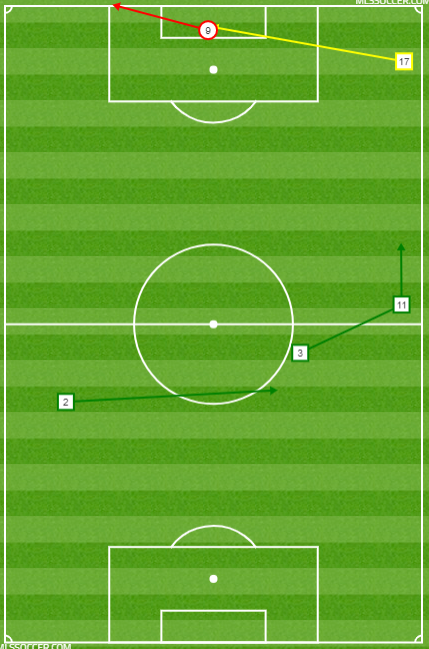 Both Gyasi Zardes and Milton Valenzuela had Opta defined ‘big chances’ against Seattle (the two big dots on the left side of the image in of Ben's tweet), which accounts for most of the gap from the Columbus perspective. Because we don't value big chances as more valuable than the exact same shot that isn't subjectively called a "big chance", we value the shots less. But somehow we still have Seattle, which didn't have any Big Chances, with nearly another .40 expected goals more than the Opta model. To be honest, I’m not sure where we specifically differ from here. Seattle really only had one shot provided by Clint Dempsey that provided any type of weight (0.285 xG). The rest of the 16 shots created by Seattle were a smattering of low quality opportunities as seen by the model. Again, our model isn’t necessarily better or worse, but it has some things which we believe help our model achieve our intended goal. It's why we have either chosen to include or exclude certain mechanisms depending on what they provide to the model. While, you don’t have to be well versed in the specifics, it’s important to acknowledge the differences as see how much the models can swing in a given game because of the various factors involved. This is just another example of why taking an individual game sample size and trying to extract meaning is both an arduous and dangerous task that needs to be done with a careful and thoughtful approach. That’s all for this week’s edition of Lowered Expectations. I hope that it lived up to yours. An extra big and very special thank you to my podcast mate and @TotalMLS twitter personality Ian L. for providing the high quality GIFs for this post.